Without an OS map, this would be a difficult church to find. I knew it was down the end of a mile-or-so long track, and at the end is Copt Hall, a National Trust site overlooking the Blackwater, but I could see no sign of the church. It wasn't where it seemed as if it should be. And then I noticed on the large PRIVATE sign outside the Big House that it said 'visitors to the church on foot only', so I walked through the gate and there was the church at the other end of the front garden. 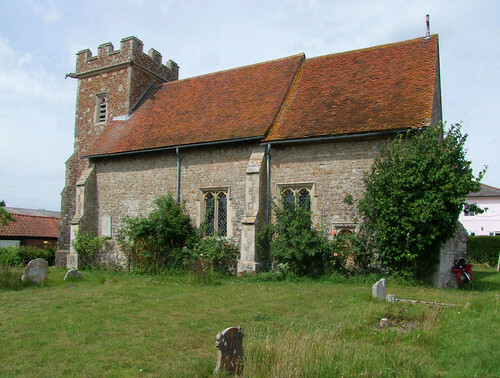 A tiny church in a tiny churchyard, substantially rebuilt after the earthquake of 1884, and I thought it might be redundant but it is still in use by the benefice. It is very much like Abberton on the other side of the reservoir. Very simple inside. A Zeppelin crashed across the lane leading to the church in 1916. There is a gravestone to someone who was killed, and inside the church a length of the aluminium framework. On the wall is a memorial to a Zeppelina Williams who died in 2004 and had been born in the parish on the night of the crash. It is obviously still the most exciting thing to have happened in the parish in the last century. Since the earthquake, in fact.